It happened on the strangest night of my life. I went for the movie Pirates of the Caribbean: On Stranger Tides yesterday (thanks to Amelia and Magnum for the movie passes). As I've mentioned before, I always love Magnum's events because they always treat you like a VIP. This one was no different. They provided excellent seats, goodie bags, the movie to be watched in 3D and a popcorn combo set to enjoy with. Only problem is, I was late to obtain the passes and all of them were grabbed finish since I was out to get some new tires on that day. I thought that this is a Magnum event that I'll have to miss. But lucky for me, Amelia had extra passes and agreed to provide me one, much to my delight. So what was so strange about that night? To my surprise, I met my ex-colleagues from not 1, but 2 of my previous companies. Pure coincidence. 1st guy (who by now has left from my previous company) used to be my IT Manager and he was there to watch Pirates of the Caribbean as well (but not with the Magnum event). As usual, he shook his head in disappointment when I told him I'm still looking around for a job ever since I left the company. LOL. The other ex-colleagues that I met who were from my previous company before the last were having a company event. Me and Amelia, Joanne and their friend, Bobby were at the bowling place's cafe to have dinner. We noticed that there were some snacks to eat there and a drinks dispenser containing orange juice and jokingly said, "Hey, there's food here already. We don't need to buy any." But of course we knew that it was for the company event that were playing bowling. But who knew that the company is a company I used to work with. I was utterly embarrassed when I couldn't recognize most of them once they spotted me and came over to greet me. But I do remember the good times working with them. They're a bunch of very nice people to work with in an equally nice, comfy and classy environment. How I miss those times (not the 2 hour jams I had to go through to get home, though). It's nice to see them again. Okay. Anyway, about the movie. 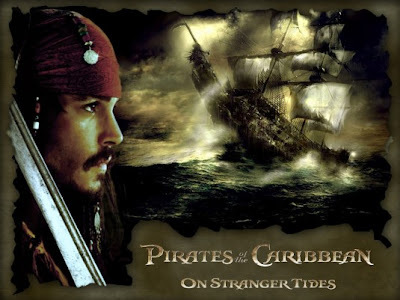 Jack Sparrow (Johnny Depp) was in London to bust Joshamee Gibbs (Kevin McNally) from a trial accusing him as Jack Sparrow and on counts of pirate activities. However, the plan didn't work and Jack was presented to the King where he was offered to help the British fleet led by Barbossa (Geoffrey Rush) to beat the Spaniards in locating the Fountain of Youth. Jack Sparrow, not wanting to relinquish his Captain position, escaped and ended up in a tavern where he found an imposter imitating as him recruiting ship crews. After a tussle with the imposter who turns out to be Angelica (Penélope Cruz), his former love interest, they worked together to avoid being captured by the British guards but little did Jack know, Angelica had other plans for him and drugged him unconscious. Once he came to, he found himself a captive in Blackbeard's (Ian McShane) ship and Angelica turns out to be Blackbeard's daughter. Apparently, they captured him to help them locate the Fountain of Youth. So there they were, 3 different fleets, the British, The Spaniards and Blackbeard's crew embarking on a journey filled with dangers. Who will get to it first? There's a short cameo after the credits if you guys are interested in staying to the end. After 3 installments of the Pirates of the Caribbean movie, it's still as interesting. I quite enjoyed watching it although I don't think it'll make a difference whether you watch it in 3D or not. It's not as much action and drama as I hope it to be, but it's a great storyline. I rate this movie 3.5 stars out of 5.
it is about movie reviews.. i have something to offer to you..